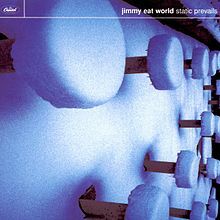 Static Prevails is the second album by Jimmy Eat World. It was released on July 23, 1996. Along with Clarity, the album was re-released in 2007 in remastered form with bonus tracks. It was produced by Wes Kidd, Mark Trombino and Jimmy Eat World. The album is the first to feature bass guitarist Rick Burch.